How do we teach Aikido? The query invites me to reflect on how I learned Aikido. I got lucky. By accident in 1978, while studying dance at The Naropa Institute, I saw a gorgeous woman in a glistening white top and black skirt seeming to fly around the room next door. I loved what I saw. My next stroke of luck occurred when I visited Seattle, WA six months later to watch Mary Heiny Sensei. I had heard about this woman who trained with O’Sensei, the founder of Aikido, and made futons for a living. I entered the dojo on an April evening, sat on the visitor’s bench and let my eyes land on the floor to ceiling calligraphy on the front wall. I had no idea what it said, but it was a captivating centerpiece in the room. The dojo was packed with people dressed in white outfits, some with black skirts, everyone alert, spinning, striking each other, laughing, and falling. At the end of the hour-long class, a dark-eyed woman walked to the center of the room and bowed to the calligraphy. For over 30 minutes she tossed seven or eight black belts all over the place. I didn’t know I was watching Kathy Bates take her nidan (second-degree black belt), but I did know I was hooked.I wanted to do what she did. Fast forward to June of 2015, I attended the week long Aiki Retreat set in the majestic Sierra Nevada mountain town of Quincy, California. Early each morning I walked through the ponderosa pines from our dorm lodging to train in the Feather River College gym. One of the focuses of the practice throughout the training was how teachers mentor teachers. I, along with each of the featured instructors, Michael Friedl, Danielle Smith, and Craig Fife Senseis, agreed to co-teach a class with a sandan (third-degree black belt) or a yandan (fourth-degree black belt) instructor. Because how to be a teacher was a theme at the retreat, a frequent question asked was how I learned to teach Aikido. Like many of my colleagues, I didn’t attend a teacher training to learn how to teach a class or run a school. There weren’t any. For many of us, our early dojos were small. Perhaps we were blue belts and one day the instructor was unable to make the class. So, our teachers asked us to get up in the front of the room, bow in and lead class. We took the dive. instruct anyone, given my minimal experience. I showed a technique, clapped, walked around the mat, trained with people, and hoped for the best. Most of the time I was scared, but also curious and intent on doing the job. At the time, I didn’t see myself teaching Aikido all my life. When I left Seattle School of Aikido to open Two Cranes in 1995, I taught a majority of the classes. My colleague Anne Yamane, and students Dan McAbee and Richard Darby, also took a slot. As the dojo grew, I encouraged more of my senior students to teach. I made a point of letting them get comfortable with the process, then I would come to watch a full class, taking notes on highs and lows. Later, I would invite the student to tea, listen to their experience leading the class, and offer my feedback. In general, it was a rewarding experience for both of us. There’s no better way to deepen our practice then to try and share how you see it with someone else. Over time, I watched a number of these students become skillful teachers, developing their own methods, and their own language to accompany the techniques. Some of these folks are still teaching decades later. Midweek at the Quincy Retreat, I had the pleasure of co-teaching with a graceful dojocho instructor. We didn’t know each other well, but we had trained together at seminars over the years. Together we bowed in and time sped by as we switched roles throughout the hour, maintaining a theme we had selected. I knew from observing her movement that she had a dance background, so it felt appropriate to focus on flow and posture, breath and shape. Both of us referenced the power of healing available to us as uke and nage in each moment. I didn’t know she was a trained psychotherapist until later, but right away I intuited that she too experienced Aikido as a healing art, capable of not just to identifying our griefs and sorrows, but also to soften the physical contractions that hold them so tight. The shared class enriched us both. The following day we met to discuss the class and I shared with her my reflections on teaching. It’s important that people feel your Aikido. Terry Dobson, Mary Heiny, and Hiroshi Ikeda Senseis all taught me that. I also find it helpful to share with a new teacher how I enter the space and work the room. Whether leading a small class or a larger seminar, when I enter the room I bow to the shomen and consciously express gratitude and ask for guidance from O’Sensei (even if I am locked in conversation). Over the years, that simple practice has shifted from an academic act to perceiving a felt sense of O Sensei’s presence in the room. I remember Motomichi Anno Sensei encouraging me to always permeate the dojo with energy of divine thanks. From that moment on, regardless of who enters into the dojo, I am prepared to be compassionate and capable of maintaining safety and protection. When I begin to teach, I draw a clover leaf around the mat and move to each of the four regions throwing and striking people as I go offering: look at this, try this, wake up, behind you, fantastic, think less and feel more, give me more! 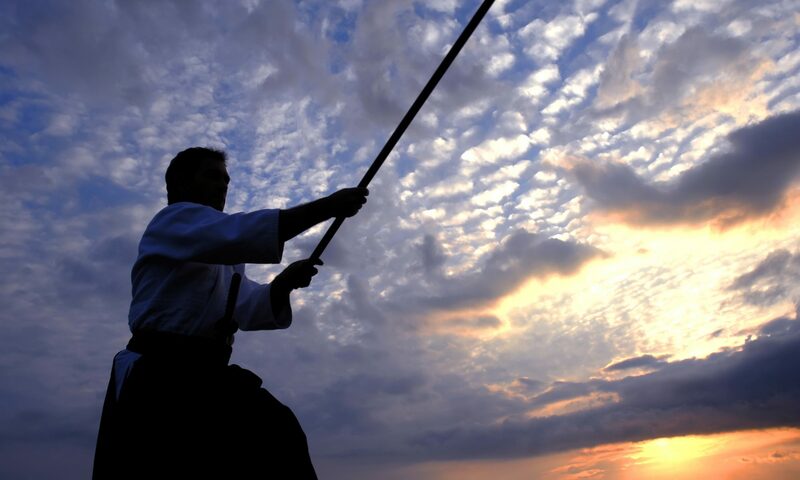 I offer them the spirit of training in Shingu, with emphasis on zanshin – always be ready, open to whatever might present itself to you from one moment to the next. Open to the wisdom streams that inspire you. Anchor yourself in the fundamentals. Train with the students in the class. Make them laugh at least once or twice. Make uke unbalanced, so he/she can follow you. Remember you are always training yourself. For me. both as a student and a teacher, the true victory is the inner joy I am capable of experiencing every moment. Previous PostPrevious Developing Good Aikido Teachers – Whose Responsibility Is It?